“That’s alright, that’s alright, come on in! It’s dinner time,” Ben Thornewill exclaimed with a laugh, pulling his face away from the microphone he’d been singing into as fast as you’d rip off a band-aid. 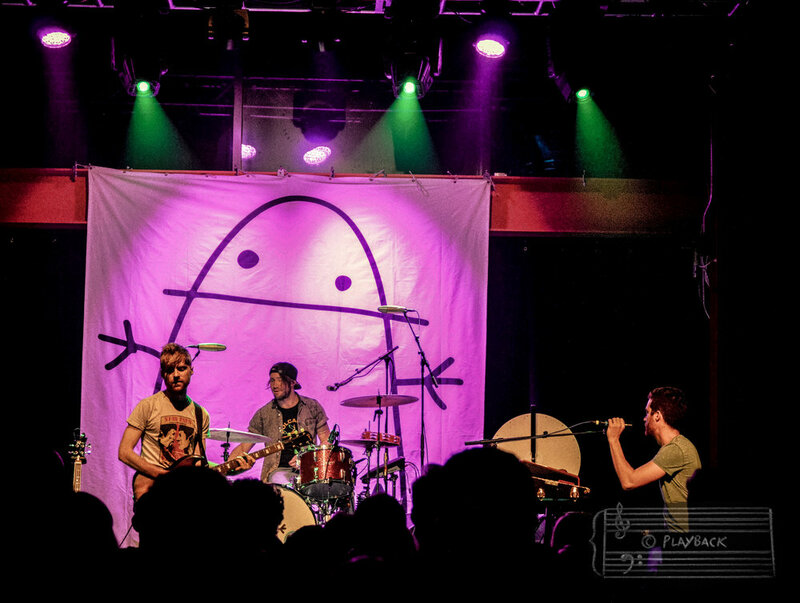 It was hours before spotlights painted the drop cloth with their logo a shade of every brilliant color imaginable at their headlining show in Bethlehem, PA (04-08-17) and the members of Jukebox The Ghost were huddled into a corner of Musikfest Café's green room. And while the floor was already crowded with the equipment needed to capture their preshow performance of “The Spiritual,” the cramped space was about to get a little smaller. Ending the acoustic rendition of the song not with it’s final notes, but with a round of smiles prompted by the fast arrival of a dinner delivery, platters were soon perched on every table and surface available. “We knew there was a risk of that happening,” Thornewill assured the venue’s staff before reshuffling items and stretching his arms out toward the endless line of heavy trays being passed to him over the open doorway, mic stands and a Wurlitzer piano. “Alright the tempo of the song has just increased by a factor of three,” Jesse Kristin said once the band graciously thanked the team of servers and the room cleared out. Laughing, Kristin and Thornewill played about five seconds of a significantly sped up version of the track that would have been the only thing to guarantee that the next performance of the song would be finished before there was another knock on the busy dressing room door. “We’re still good?” Thornewill laughed before he, Kristin and Tommy Seigel took their chances with another take. Although almost as soon they began playing, the comical, haphazard scene of the prior moments faded. Lending a touch of gospel tinged soul to a full, gorgeous melody, the group’s session illuminated every facet of a purely sublime sound.